Robert Pilgrim has operated cranes all his working life, starting at the age of 17 for general contractors pouring concrete, erecting steel and setting all types of equipment. In 1980, he struck out on his own, leasing a 27.5 ton truck crane. He soon upgraded by purchasing a 30 ton truck crane to expand his market and ability to take on bigger and more profitable jobs. In 2010, Robert designed his first Alternative A Frame. Built out of steel, with a top spreader bar and large, swiveling, locking pneumatic wheels, the Alternative A Frame stands at 8’6” tall, with 3’ leg extensions raising it to 11’6”. Chain falls at each end of the A Frame do the heavy lifting. Robert certified the Alternative A Frame at 3,500 lbs. using a 8’ spreader bar through his local Rigging Supply Co. It takes just a few minutes to assemble the unit and only 2 to 4 people to roll units up to 3500 lbs. 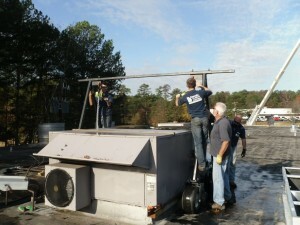 The second job where the Alternative A Frame was used required replacing a 3000 lb. York AC unit up 30’ and over 225’. The job went as planned. The third job, at a mall, required replacing a 2500 lb. Carrier unit up 30’ and over 650’ with a curb adapter on a 30 degree angle roof curb. The mall manager did not want the mechanical contractor to use a helicopter because of the cost and evacuation of that part of the mall. This job was Robert’s longest roll and the Alternative A Frame performed without any difficulties. Robert has since been awarded U.S. Utility Patent 9,592,998 for the Alternative A Frame and has contracted with a manufacturer to produce the units. Over a dozen more jobs have been completed using the system, with customers praising how well the units work. A trailer and rigging package are available as accessories. 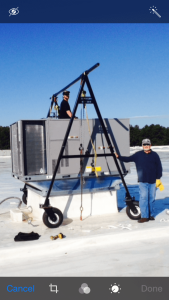 Most commercial HVAC and Ventilation companies, crane truck operators, commercial roofing businesses and even school systems will find the Alternative A Frame a useful tool to have available. For more information, contact Robert Pilgrim by sending him an email or calling 404-538-4274.